But… Shouldn’t Duct Tape Work On Ducts? Stunningly and ironically, duct tape isn’t approved for duct work. If you’re a professional in the HVAC field, you already know that. For everyone else, it’s probably a surprise. This article will help you to choose an appropriate tape or mastic that best accompanies your sealing work over HVAC systems. A good tape or mastic is essential to make HVAC systems more energy efficient by avoiding leakage. Leaky ducts can result in increase in heating and cooling costs. Energy efficiency can be ensured by choosing well between mastic and foil tape for your leakages. 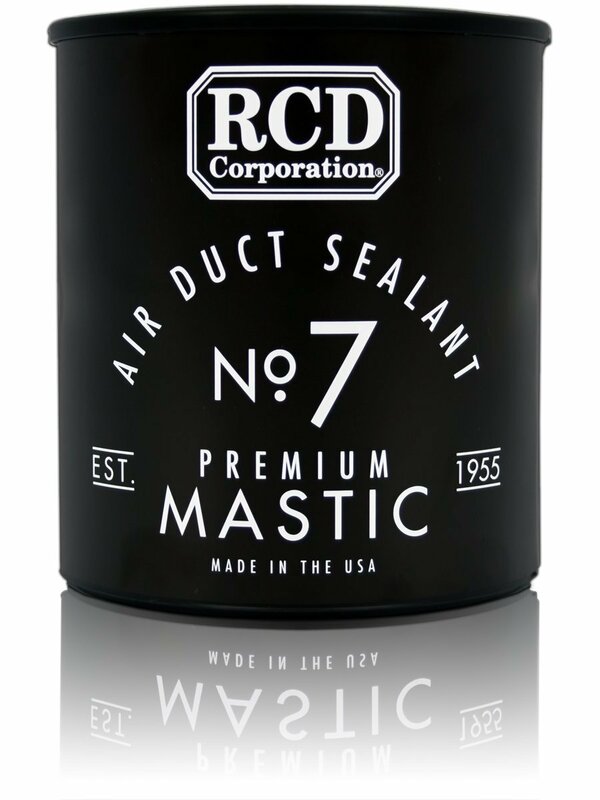 Mastic is preferred for HVAC leakage repairs and duct work because it is easy to apply in unreachable nooks. This gooey substance can be applied using a paintbrush. There is no fear of the mastic stripping off, keeping the ducts leakage-proof. This is the best option if you need to seal HVAC systems with dusty and irregular surface. Mastic also comes in the form of tapes made of aluminium foil. Mastic and mastic tapes stay strong even on moist and gutter areas. It can be used for both indoor and outdoor purposes. Foil tape wins over duct tape in many aspects because of its strength. But mastic is preferred over foil tape as it can be applied on all surfaces. High.quality foil tapes seal and work for more than a decade in many cases. They can function in humid and low temperatures without any concern of peeling off. It is greatly preferred to seal heating, air conditioning and refrigeration systems. It’s often used for insulation, seaming and patching work. Over the course of years, both these materials have been improved in strength and so are used even for smaller and domestic HVAC system repairs. To help you avoid the hassle of searching, we have researched and listed 4 foil HVAC tapes that can help you in fixing HVAC ducts. While you could have a very specific need for which the following may not be the best solution, these can come in handy for the majority of ductwork. This product receives high marks all the way around. 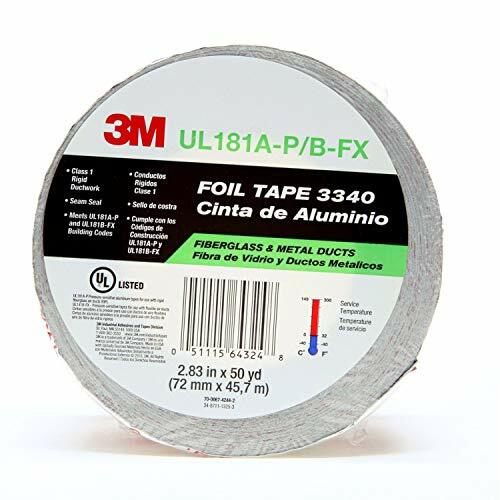 It is a UL181B-FX listed silver adhesive tape approved for use on flexible air ducts and is rated for resistance to flame and smoke. It’s made to work in temperatures ranging from -10 to +210-Degree (Fahrenheit). It works for both indoor and outdoor use and is ideal for sealing both cold and hot air ducts. 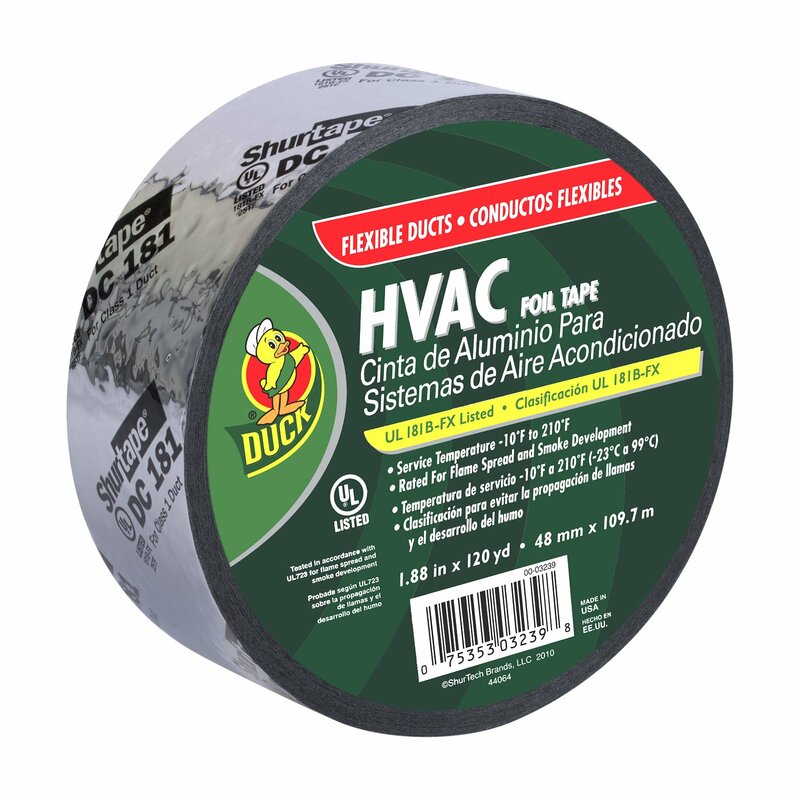 Each roll of Duck Brand HVAC Foil Tape is 1.88 inches wide x 120 yards long. One word of caution is you need to use this tape on a clean surface. Also, it’s a rather thin tape. If you personally prefer something thicker, this might not be the product for you. This is a UL-181AP and UL-181 B-Fx rated product for ductwork. 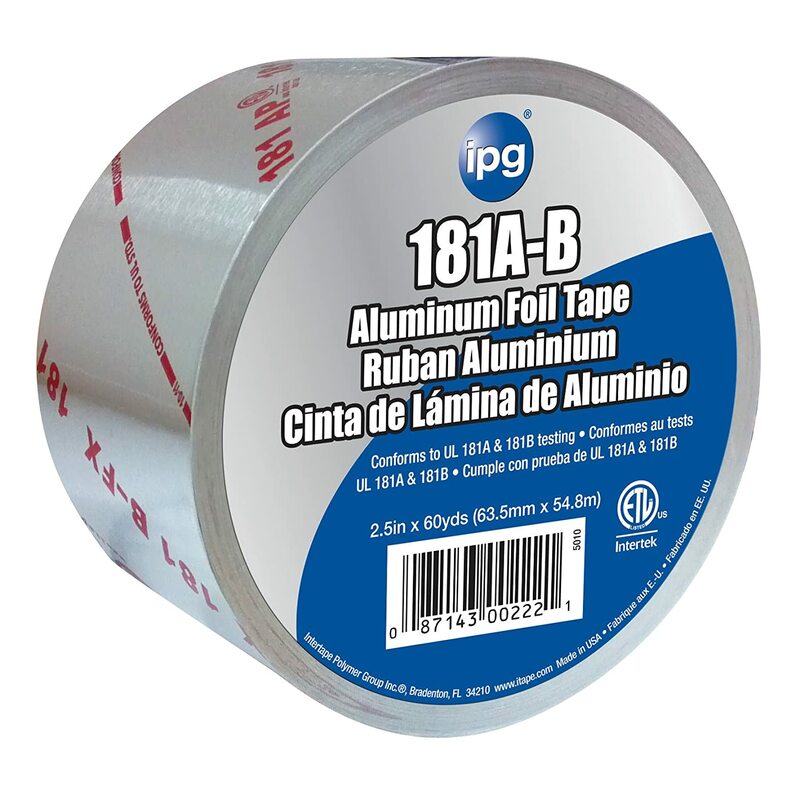 This aluminium foil tape has a great backing, making it easy for identification and inspection. This is an acrylic-based pressure-sensitive adhesive combined with the conformability/flexibility of biaxial-oriented polypropylene (BOPP) film. It provides superior sealing, protective benefits, and ease of handling. Some features of this tape are that it is flame retardant, has high shear, and is UV resistance. It also has superior bonding at sub-zero and at elevated temperatures. The best part is that it maintains vapor barrier integrity. 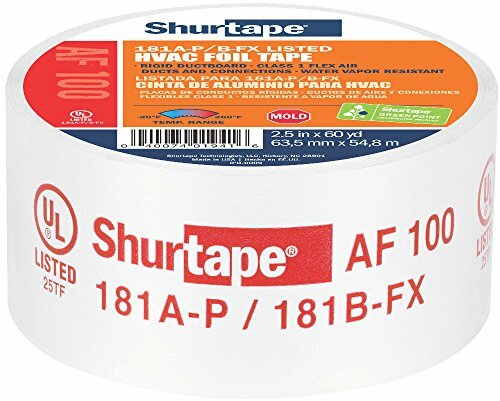 We have this Shurtape product on our list because it is a 5-star HVAC tape and is preferred for its tack and adhesiveness.This is a UL 181A-P/B-FX-listed aluminium foil tape that comes in a roll 2.5 inches wide and 60 yards in length. It is lined and backed for identification. It is great for for joining and sealing joints, connections and seams on rigid fiberglass duct board and flexible air duct. 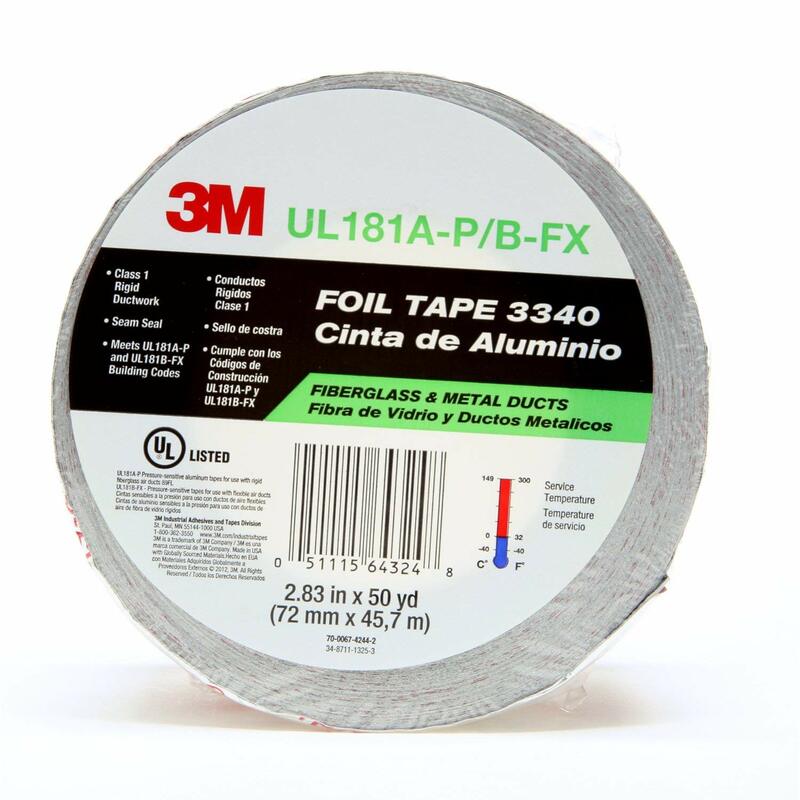 3M offers us another highly-esteemed tape that is used widely. It measures 2.5 inches wide x 50 yards and has an acrylic adhesive. Some of the features that you can look forward to with this tape are resistance to flame, moisture, weather, UV degradation and chemicals. Also is a thermally conductive tape for heating and cooling efficiency with heat reflectives. This is a UL 181 A-P and UL 181 B-FX listed tape with printed backing for HVAC systems. The only turn-off could be that the backing has red words on it and hence could make your tape work a bit too obvious. Where you choose to use mastic instead of foil tape, you can use the following products with confidence. They’ve all earned fine reputations and have utility that can be vouched for. Hardcast mastic tape, used as a sealant, has little to nothing going against it. This is a great home improvement tool for DIY kitchen and dining hacks too. 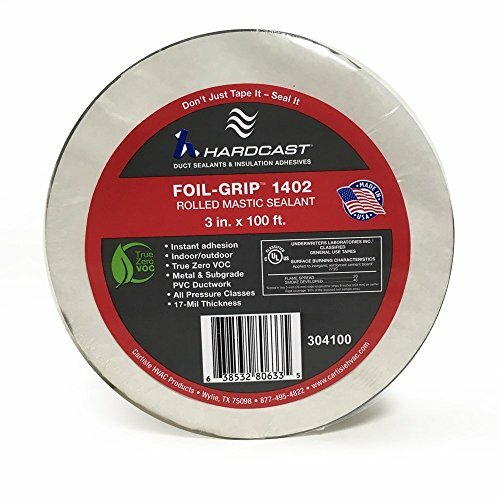 This foil grip sealant is best for duct joints and is pressure-sensitive for a 40-year cycle. It’s also water resistant on most surfaces. No. 7 offers this gray-colored, 915ml container of mastic that comes with an entire application tool kit. Apart from the mastic itself, the kit includes a brush, flashlight with batteries, can opener, red shop towel and black burlap bag. This comes with a 12-month warranty. It is a water-borne air duct sealant, used for permanently sealing the fabricated joints and seams of sheet metal air ducts, rigid fiberglass air ducts, flexible air ducts and thermal insulation. 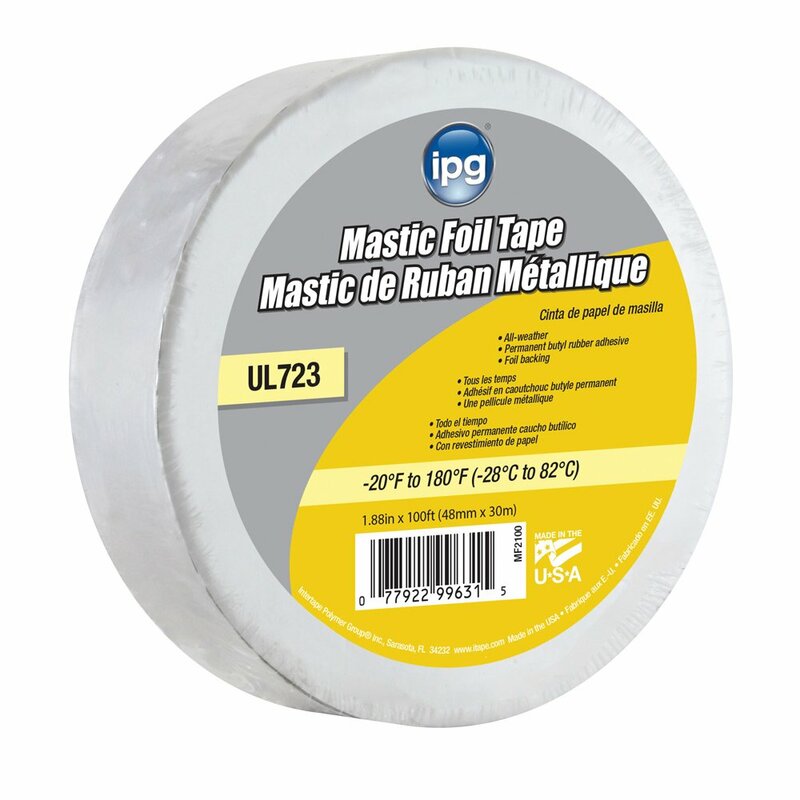 This mastic tape from Intertape is considered to be a great sealant tape. It has a Butyl foil tape and comes in a 100 feet length. It can withstand temperatures between -20 to 200 degree fahrenheit. It is ideal for replacement applications and other general-purpose duct joint and HVAC applications and is tested in accordance with UL-723 seal. It’s also a LEED point contributor for “green” applications. It provides an instant waterproof grip to a variety of surfaces and a full bond in 24 hours. It is highly resistant to the effects of weather, UV, temperature, mold and mildew. It’s also paintable! United States HDW offers this duct seal that’s known to work great in combination with a foil tape. It’s a great hardware glue for duct joints. 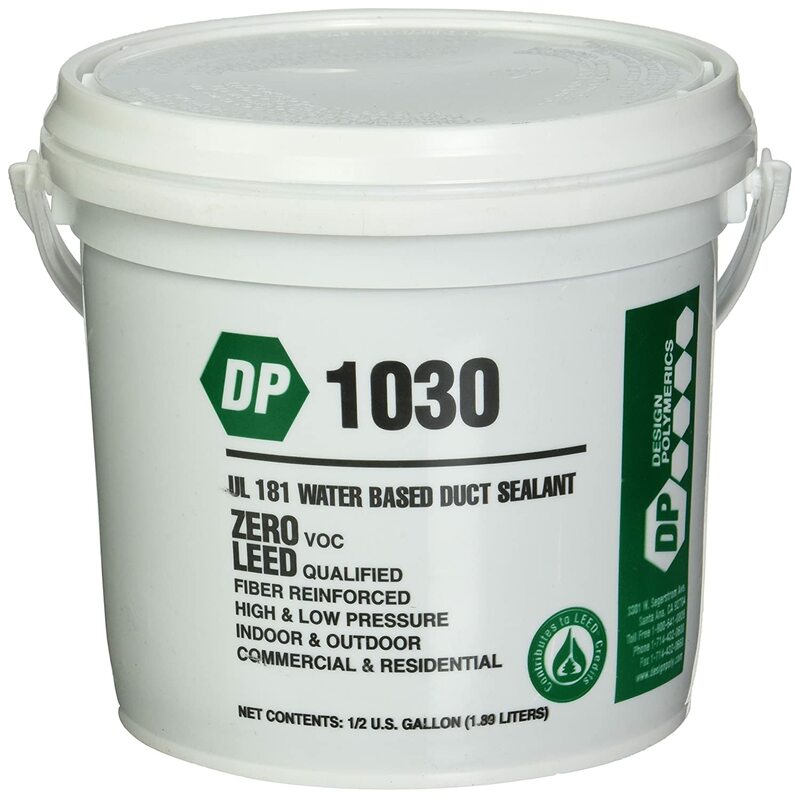 It’s an easy-to-use paintable sealant that is water based and fiber reinforced. This product is best for sealing connections on flexible duct or fiberglass duct board. It is crack- & peel-resistant, mold & mildew resistant and great for both indoor & outdoor use. It is UL Listed 181A-M/B-M and LEED Qualified. However, if applied in thin layers it may get brittle. So don’t try to skimp on application! Choosing the right kind of tape for duct work can be tricky. The following guide will help you to purchase the right type of tape for this purpose. Some factors that you need to look for are explained here. Tapes are backed by a film that provides good electrical insulation and protection. This is a critical feature to consider when seaming work is undertaken for house wrap or insulation. It indicates to the technician which side of the tape has the adhesive. The tape could have a backing made of film, cloth or foil. It is not meant only for aesthetic appeal but is also used to protect the adhesive on the other side. While backing constructs one side of the tape, adhesive forms the other. Choose your adhesive based on the type of working you’re doing. Its relevance is determined by its stickiness, durability and usage. Adhesives could be made of rubber, acrylic or butyl. Rubber adhesives offer good tack and adhesion but do not perform well below the freezing point of 32 degree Fahrenheit. Butyl on the other hand makes a good rubber adhesive, but also performs well in extreme temperatures and preserves good flex qualities. Acrylic adhesives offer a good balance of adhesion, shear and tack, with good resistance to thermal and UV degradation. This is a factor that keeps the air from leaking out. With air-tight tapes comes less permeability, ensuring less or no leakage. You need to be looking for zero permeable tapes. These are typically supported well by acrylic adhesives. Adhesion is the ability to form a permanent and strong tack onto the surface. A strong tack prevents the tape from rolling up or flagging during installation. Tape should also have a good initial quick stick. This determines the ability of the tape to be pressed around irregular and non-smooth surfaces. Tack is the ability of the tape to stick immediately upon application. It also shows the strength of the tape to hold different applications and material. Using tapes that are code compliant is essential to pass inspection. It’s important to adhere to necessary safety measures and the quality required work on HVAC systems. In this context, UL listings are critical. UL Listing means that UL has tested representative samples of a product and determined that it meets UL's requirements. Depending on the task at hand, you’ll need to be sure that the adhesive is appropriate and approved on the UL listing. HVAC tapes are pressure sensitive and hence the technician needs to adhere to the respective application technique. Implementing the right application technique ensures that the adhesive is intact and the tape works its best. The optimal tool that will provide the right pressure to create a permanent sealing with the tape is a squeegee. Note that the term ‘duct tape’ is very misleading in this context. Duct tape is neither recommended nor approved to seal or stop leakages. If you intend to use duct tape, it will not be a permanent solution for your leak. Since duct tape is normally made of cloth or scrim-backed pressure-sensitive tape, it does not seal leakages well in high temperatures. HVAC systems are constantly exposed to wide range of temperature variations. That makes duct tapes susceptible to become brittle and chipping off after a short amount of time. Lab tests and research have also confirmed that duct tapes produce toxic smoke when exposed to heat. They do not carry any safety certifications such as UL or Proposition 65. We want to skirt our RV this winter with tarps. We will need a tape which can take minus 15 celcius temps, and not leave a residue or peel off the paint. Which would you recommend? Thank you. Sorry, not too experienced with tarps.